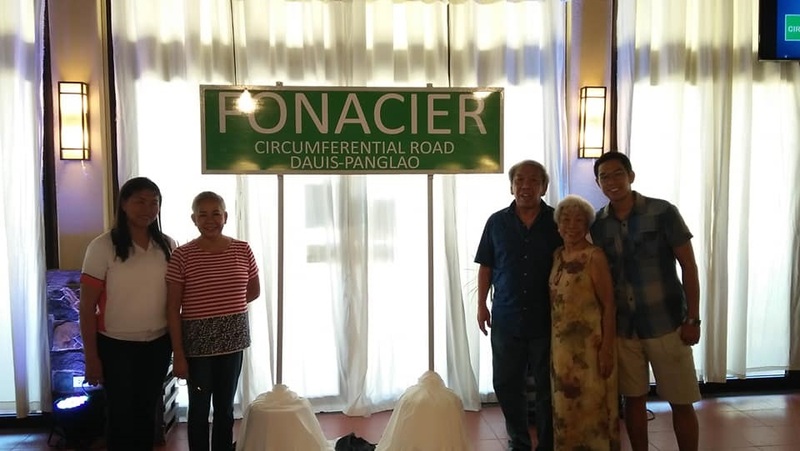 The Anos Fonacier Circumferential Road which honors late hotelier Anos Fonacier, a man deemed to be the “Father of Bohol Tourism,” was officially launched on Thursday. The 35-kilometer national road, formerly known as the Panglao Island Circumferential Road, was renamed “in recognition of the remarkable achievements and contributions of the late Anos Fonacier in the development of Bohol’s tourism” through Republic Act 11064 which was signed by President Rodrigo Duterte on August 23, 2018. The circumferential road traverses the resort island of Panglao through the Municipality of Panglao via barangays Tangnan, Bil-isan, Looc, Poblacion, Danao, Tawala, Bolod and Libaong and the Municipality of Dauis via barangays Totolan, Songculan, Tabalong, Bingag, Dao, San Isidro, Biking 1 and 2, Catarman, Mayacabac, Poblacion and Union. A ceremony for the launch of the renamed thoroughfare and unveiling of the road’s signage was held at the Bohol Beach Club Resort in Panglao on Thursday with Fonacier’s family led by his wife, Josephine, in attendance. Fonacier’s friends, banker Richard Uy and Bohol Chronicle Radio Corporation chairman Peter Dejaresco also joined the event together with the Bohol media. Fonacier established the Bohol Beach Club in 1984, prior to Bohol’s rise as one of the top tourist destinations in the country. He would later reap various accolades for his contributions to tourism not just in Bohol, but also in Cebu. “As you can see, he quickly embraced Bohol people as his own. One of his favorite award was…of calling him a son of Bohol,” she said. Interestingly, Bohol’s father of tourism was not a Boholano; he was an Ilocano. Fonacier was born in Sarrat , Ilocos Norte but he would later venture into the tourism industry in Central Visayas, particularly in Cebu then Bohol. He established Marco Polo Plaza Cebu (then Cebu Plaza Hotel), Tambuli Resort, Argao Beach Resort and Cebu Beach Club.